Most of daily life in the Aztec Empire depended on a person’s social status, whether they were a member of the nobility or of the commons. That status determined what people ate, what they wore, their style of house and their occupation. 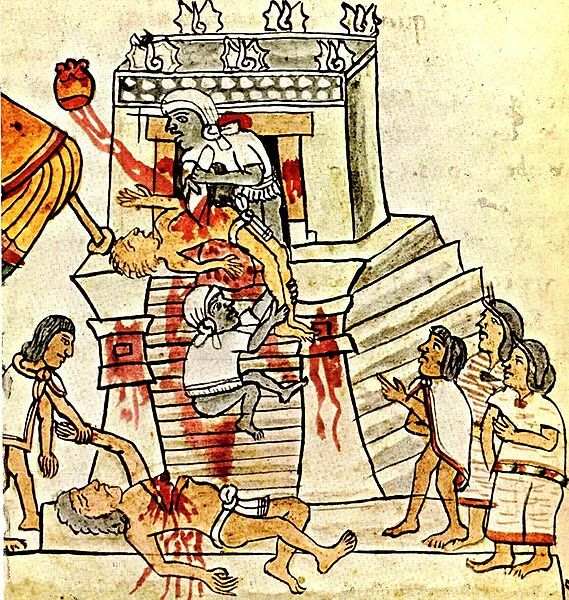 The Aztecs were an agriculturally-based society and most spent their days working their fields and gardens or otherwise participating in cultivating food for their great city of Tenochtitlan. Maize or corn was the dominant staple crop of the Aztecs and other Mesoamerican cultures. Maize could grow nearly everywhere except on mountains. As the dominant staple, corn was eaten every day in different forms. Shelled corn was first soaked in an alkali solution, then ground into meal, a kind of flour. The meal was shaped into a flat bread called a tortilla, then fried on a griddle. Other main crops included a variety of beans and squash, which were eaten daily or often. The combination of corn and beans or a grain and beans makes a perfect protein, capable of sustaining life. The Aztecs combined these main crops with gardens of avocados, chilies, tomatoes, onions, amaranth, cashews, peanuts, sweet potatoes, jimaca and many species of cactus. Aztec commoners ate a predominantly vegetarian diet, occasionally flavored with meat or fish. The maguey plant provided not only food in the form of sweets, but an alcoholic drink called pulque and fiber for clothing. Chilies added heat and spice to many dishes as well as providing vitamins A and C to the Aztec diet. While fields of corn, beans and squash around the city provided the staples of the diet, many families also had gardens of vegetables and fruits that produced much of their food. Aztec farmers raised turkeys, dogs and duck for meat and eggs, but they also hunted and fished, which brought deer, iguana, rabbit, fish and shrimp to the table. Insects such as grasshoppers were easily harvested and eaten as well. Algae from the abundant lakes provided a rich source of protein, vitamins and minerals. Chocolate made from cacao beans was Mesoamerica’s gift to the world, and was consumed often by Aztec nobles. 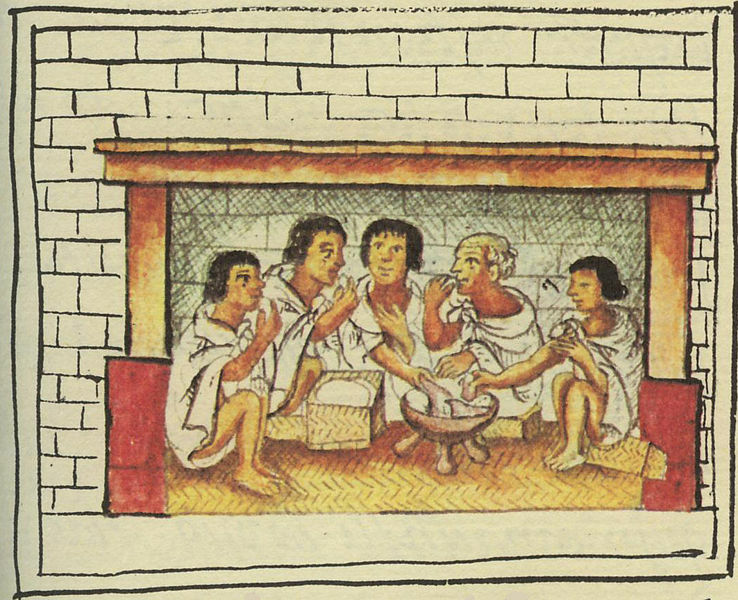 Aztec commoners ate two meals a day. They ate the first meal after a few hours of morning work, usually a maize porridge with chilies or honey or perhaps tortillas, beans and sauce. 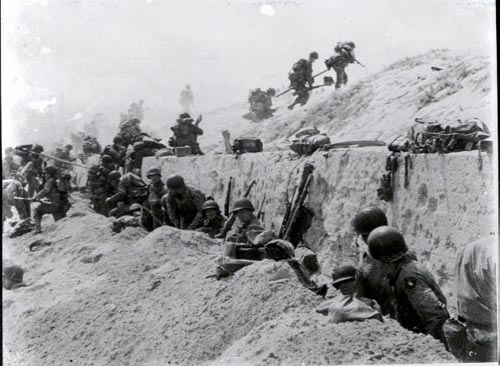 They ate the main meal of the day at the hottest time of the day, in the early afternoon. Tortillas, tamales, beans, a casserole of squash and tomatoes with water or pulque to drink were common fare. 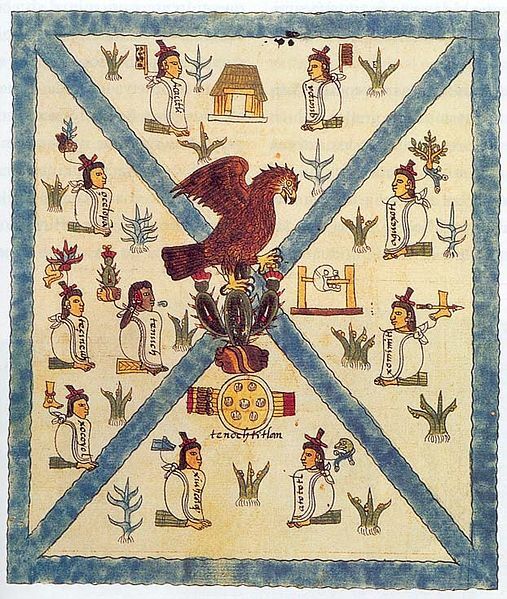 Noble Aztec families could eat more often of a greater variety of foods, especially some form of meat, but their meals would also begin with the basics of tortillas and beans. The religious calendar determined both feasts and fasts. A feast would provide many more foods than normal meals, of course, cooked in special ways, as well as foods not often in the daily diet such as a rich variety of meats. Feasts could be quite elaborate with hundreds of dishes and various alcoholic drinks served.